The Corona de Aragón Fire, was a fire that killed at least 80 people in the five star Corona de Aragón Hotel in Zaragoza on 12 July 1979. At the time of the event the Hotel lodged high-profile General Franco family members Carmen Polo, Carmen Franco y Polo and Cristóbal Martínez Bordiú, as well as many high-ranking military personnel, five of whom died in the fire. Stars are often used as symbols for ratings. They are used by reviewers for ranking things such as films, TV shows, restaurants, and hotels. For example, a system of one to five stars is commonly employed to rate hotels, with five stars being the highest quality. At the night of the fire there was 300 registered guests, with the majority Spanish citizens. Nearly 200 guests were evacuated from the 10-story hotel, however many attempted to climb down ropes of bed sheets or tossed children out of windows into firemen's nets. Two United States Air Force helicopters from the Joint American-Spanish air base outside Saragossa were used in the evacuation of guests,  and some guests lay in the swimming pool on the roof until they were evacuated. It was reported that those who could not jump to safety, reach the ladders, or escape from their rooms, died due to suffocation. 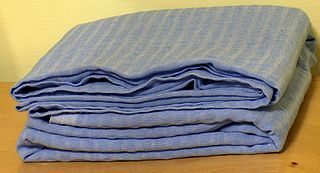 A sheet is a rectangular piece of cloth used as bedding, being placed immediately below or above bed occupants. Bed sheets can generally be divided into two categories: "top" and "bottom" sheets. Asphyxia or asphyxiation is a condition of severely deficient supply of oxygen to the body that arises from abnormal breathing. An example of asphyxia is choking. Asphyxia causes generalized hypoxia, which affects primarily the tissues and organs. There are many circumstances that can induce asphyxia, all of which are characterized by an inability of an individual to acquire sufficient oxygen through breathing for an extended period of time. Asphyxia can cause coma or death. Fire investigation, sometimes referred to as origin and cause investigation, is the analysis of fire-related incidents. After firefighters extinguish a fire, an investigation is launched to determine the origin and cause of the fire or explosion. Investigations of such incidents require a systematic approach and knowledge of basic fire science. ETA, an acronym for Euskadi Ta Askatasuna, was an armed leftist Basque nationalist and separatist organization in the Basque Country. The group was founded in 1959 and later evolved from a group promoting traditional Basque culture to a paramilitary group engaged in a violent campaign of bombing, assassinations and kidnappings in the Southern Basque Country and throughout Spanish territory. Its goal was gaining independence for the Basque Country. ETA was the main group within the Basque National Liberation Movement and was the most important Basque participant in the Basque conflict. The Association of Victims of Terrorism is a Spanish association created in 1981 by victims of terrorist attacks. Its members include those injured by ETA, GRAPO, the Provisional Irish Republican Army and Al Qaeda, as well as their families. It does not, however, include victims of extreme right Spanish groups such as GAL, Warriors of Christ the King and others. Its membership exceeds 6,000. The Council of State, is the supreme consultative council of the Spanish Government. The current Council of State was established in 1980 according to the article 107 of the Constitution of 1978. The institution of the Council of State, understood as supreme consultative council of the Government, has existed intermittently since 1812. During the Ancien Régime, the Council of State advised the King about foreign policy. Napalm is an incendiary mixture of a gelling agent and a volatile petrochemical. The title is a portmanteau of the names of two of the constituents of the original thickening and gelling agents: co-precipitated aluminium salts of naphthenic and palmitic acids. Napalm B is the more modern version of napalm and, although distinctly different in its chemical composition, is often referred to simply as "napalm". The Revolutionary Antifascist Patriotic Front (FRAP) was a radical Spanish Anti-Francoist, Marxist–Leninist revolutionary organization that operated in the 1970s. This group was initially inspired by the success of the student demonstrations of May 1968 in France. El Mundo, formally El Mundo del Siglo Veintiuno is the second largest printed daily newspaper in Spain. The paper is considered one of the country's newspapers of record along with El País and ABC. The Civil Guard is the oldest law enforcement agency covering the whole of Spain. It is organised as a military force charged with police duties under the authority of both the Ministry of the Interior and the Ministry of Defence. The corps is colloquially known as the benemérita (reputable). In annual surveys, it generally ranks as the national institution most valued by Spaniards, closely followed by other law enforcement agencies and the military. It has both a regular national role and undertakes specific foreign peace-keeping missions. As a national police force, the Guardia Civil is comparable today to the French National Gendarmerie, the Italian Carabinieri, the Portuguese National Republican Guard and the Dutch Royal Marechaussee as it is part of the European Gendarmerie Force. The 2004 Madrid train bombings were nearly simultaneous, coordinated bombings against the Cercanías commuter train system of Madrid, Spain, on the morning of 11 March 2004 – three days before Spain's general elections. The explosions killed 193 people and injured around 2,000. The bombings constituted the deadliest terrorist attack carried out in the history of Spain and the deadliest in Europe since the 1988 bombing of Pan Am Flight 103 over Lockerbie, Scotland. 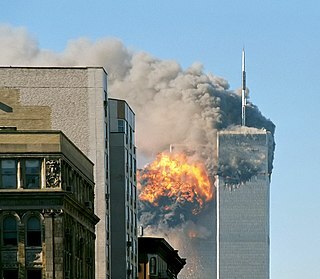 The official investigation by the Spanish judiciary found that the attacks were directed by an al-Qaeda terrorist cell, although no direct al-Qaeda participation has been established. Although they had no role in the planning or implementation, the Spanish miners who sold the explosives to the terrorists were also arrested. The 2004 European Parliament election in Spain was held on Sunday, 13 June 2004, as part of the EU-wide election to elect the 6th European Parliament. All 54 seats allocated to Spain as per the Treaty of Nice were up for election. Jaime Mayor Oreja is a Spanish politician of the People's Party. He has served as a member in the Basque Parliament, the Spanish Parliament, and the European Parliament, as well as serving in various ministries, within both Spanish and autonomous Basque Governments. He is known for his outspoken anti-ETA rhetoric. The 2006 Madrid–Barajas Airport bombing occurred on 30 December 2006 when a van bomb exploded in the Terminal 4 parking area at the Madrid–Barajas Airport in Spain, killing two and injuring 52. On 9 January 2007, the terrorist organisation ETA claimed responsibility for the attack. 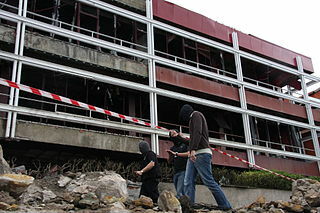 The attack, one of the most powerful carried out by ETA, damaged the airport terminal and destroyed the entire parking structure. The bombing ended a nine-month ceasefire declared by the armed organisation and prompted the government to halt plans for negotiations with the organisation. Despite the attack, ETA claimed that the ceasefire was still in place and regretted the death of civilians. The organisation eventually announced the end of the ceasefire in June 2007. The controversy regarding the handling and representation of the Madrid train bombings by the government arose with Spain's two main political parties, Spanish Socialist Workers' Party (PSOE) and Partido Popular (PP), accusing each other of concealing or distorting evidence for electoral reasons. ETA's 2006 "permanent ceasefire" was the period spanning between 24 March and 30 December 2006 during which, following an ETA communiqué, the Spanish government, led by José Luis Rodríguez Zapatero on one side, and the militant group on the other, engaged in talks as a means to agree on a formula to voluntarily disband the latter. It was terminated as a result of the 2006 Madrid Barajas International Airport bombing. The Basque conflict, also known as the Spain–ETA conflict, was an armed and political conflict from 1959 to 2011 between Spain and the Basque National Liberation Movement, a group of social and political Basque organizations which sought independence from Spain and France. The movement was built around the separatist organization ETA, which had launched a campaign of attacks against Spanish administrations since 1959. ETA had been proscribed as a terrorist organization by the Spanish, British, French and American authorities at different moments. The conflict took place mostly on Spanish soil, although to a smaller degree it was also present in France, which was primarily used as a safe haven by ETA members. It was the longest running violent conflict in modern Western Europe. It has been sometimes referred to as "Europe's longest war". The 2008 Getxo bombing occurred on 19 May 2008, when a van bomb went off outside a boat club in the town of Getxo, Biscay in the Basque Country, Spain. The attack caused serious damage to the club, as well as nearby buildings and structures. 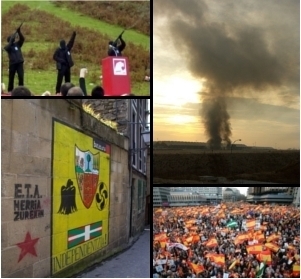 No one was killed or injured after a warning call from the Basque separatist organisation ETA. On 31 May, the organisation claimed responsibility for the bombing. The 1987 Zaragoza barracks bombing was a car bomb attack by the Basque separatist organisation ETA, which occurred on 11 December 1987. A vehicle containing 250 kilograms of ammonal was parked beside the main Guardia Civil barracks in the city of Zaragoza, Spain; its subsequent explosion caused the deaths of 11 people, including 5 children. A total of 88 people were injured, the majority of them civilians. Irene Villa is a Spanish author and journalist who became a political figure after losing both legs in an ETA attack in Madrid at the age of 12. She was particularly vocal in her opposition to José Luis Rodríguez Zapatero's policy of offering peace talks to the group if they disarmed. She has since become a para-alpine skier. The Monbar Hotel attack was carried out by the GAL, a state-sponsored death squad, on 25 September 1985 in Bayonne, France. The targets were four members of ETA military, whom the Spanish government believed to be senior figures in the organisation, itself proscribed as a terrorist group in Spain and France. All four people were killed, with a fifth person, apparently unconnected to ETA, injured in the shooting. This represented the deadliest attack carried out by the GAL. Although two of the participants were apprehended shortly after the shooting, controversy surrounded the possible involvement of senior figures in the Spanish police. The Great Fire of Valparaíso started on 12 April 2014 at 16:40 local time, in the hills of the city of Valparaíso, Chile. The wildfire destroyed at least 2,500 homes, leaving 11,000 people homeless. An additional 6,000 people were evacuated from the city, which was placed on red alert and declared a disaster zone. Fifteen people were confirmed killed and ten suffered serious injuries. The assassination of Augusto Unceta Barrenechea was an attack by the Basque separatist group ETA which took place on 8 October 1977 in Guernica in the Basque Country in northern Spain. Etxerat is an association of family members of people who have been imprisoned or exiled because of their activity in support of the Basque National Liberation Movement. Most of those prisoners and exiles are members, or former members, of the Basque armed terrorist organization ETA. Others were not members of ETA but have been jailed for collaborating with it, or have been convicted of other crimes such as belonging to illegal organizations like SEGI or Gestoras pro Amnistía, belonging to or trying to rebuild banned political parties such as Batasuna and Askatasuna, participating in Kale borroka, or for the "public glorification of terrorism". Etxerat's primary activities are to support those family members, and to campaign to defend the rights of their imprisoned and exiled relatives. Triple A was a Spanish far-right paramilitary, Spanish nationalist group active from 1977 to 1982, primarily in the southern Basque Country but also in the French Basque Country and Barcelona. A June 2010 report by the Office for Victims of Terrorism of the Basque Government attributed eight murders with 66 deathly victims in the Basque Autonomous Community to the group and linked it to the Spanish police, SECED and the Guardia Civil. The group attacked the satirical magazine El Papus in Barcelona, killing one person and injuring 17. Jesús María Pedrosa Urquiza .He was a Spanish politician victim of terrorism of ETA. Francisco José Alcaraz Martos is a Spanish politician and activist, who served as president and spokesman for the Asociación de Víctimas del Terrorismo between 2004 and 2008. He is the founder and president of the association Voces contra el Terrorismo. 1 2 "71 Persons Are Killed and 47 Hurt As Blaze Sweeps a Spanish Hotel" . Retrieved 2018-08-31. ↑ Nooteboom, Cees (2009). Nomad's Hotel: Travels in Time and Space. Mariner Books. p. 88. ISBN 978-0156035354. ↑ El incendio del Corona de Aragón, fue provocado, según "El Alcázar"
↑ Simancas Cruz, Moises (2018). "Strategies to improve the quality and competitiveness of coastal tourism areas Applying tourism standards". Journal of Tourism Analysis: Revista de Análisis Turístico. 25: 71. ↑ "Misterio en el Corona de Aragón. Muchos situaron a ETA detrás del incendio que mató a 80 personas...En todo momento, las autoridades aseguran que se trata de un hecho fortuito, pero son muchos los que colocan a ETA detrás de este trágico suceso...En 2000, los familiares de los fallecidos comienzan a recibir las indemnizaciones... El estado asume así de facto la autoría de ETA" Cited from "El Camino de la libertad 2.1979", ISBN 978-84-92540-00-6, page 68. Published by "El Mundo"
↑ FRAP - Grupo Armado Archived 2012-06-20 at the Wayback Machine . ↑ "En 2000, los familiares de los fallecidos comienzan a recibir las indemnizaciones...El estado asume así de facto la autoría de ETA" Cited from El Camino de la libertad 2. 1979, page 68. Published by "El Mundo"
↑ Civil Guard website listing the Civil Guard retired high rank member died in the fire as an ETA victim Archived 2008-06-07 at the Wayback Machine .